Have you ever missed the TV shows due to the busy and felt very regret about this? If the answer is affirmative, go to Windows Media Center (totally free) for help and record the awesome TV shows for watching when free. Windows Media Center is a stunning digital video recorder that developed by Microsoft. With it you can view, record and organize live television and through recording the awesome WTV recordings you can enjoy the missed recordings on smartphone, tablets or some other media streamers freely. However, the format of WTV file is withdrawn among video formats and only supported by few media players but not for our popular media players. So if you want to watch a TV program on a portable player, a WTV video converter is essential for you. Here the program named Aovsoft Video Converter Ultimate is powerful tool that designed to help the users to convert WTV to some other video for playback on various of media players. Step 1: Free download Aovsoft Video Converter Ultimate to your PC, then install and run it. Right hit the big icon “Add Files” to load your WTV files to this video converter and wait a moment the recordings will be loaded successfully soon. 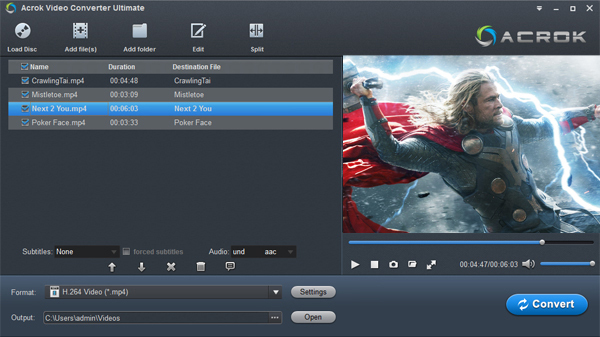 With the built-in video editor, users can custom the WTV file before convert the file freely, such as trimming your video, cropping and adding effects, watermarks, subtitles to these recordings etc. Hit the “Profile” drop-down menu, which was on the right side of the program; and then select mp4 video format as our target video format. Optionally, you can select your wanted video format according to your intention. Finally, click on “Convert” to begin converting your WTV video to MP4 format. That’s all!